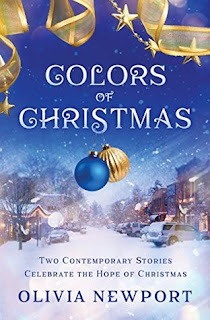 My thoughts: Since Christmas in Gold is actually the first story in this book, I went into CHRISTMAS IN BLUE expecting women's fiction and not a romance and that is what it was. Women's fiction. I have read some reviews on this book earlier, trying to decide if I wanted to buy it or not and some commented how much they hated the second story. I LOVED IT. Yes, it was a bit slow and yes, it did start with a death and someone depressed, but it showed how one could overcome obstacles in the most unexpected ways if they are open to them. This was actually my favorite of the two stories in this book. My thoughts: CHRISTMAS IN GOLD is a sweet novella about an eighty year old woman with memories and hope and a thirty year old therapist who has no hope. It was a good story and I enjoyed reliving Astrid's memories and her overtures of friendship with Carly, but it felt unfinished. Astrid's Christmas was sweet, but Carly's story is unfinished. I would've liked to have her story developed more and wrapped up for a HEA. This is not a romance, though, but women's fiction and rules are different. There is no romance in the story. My overall thoughts: I enjoyed this collection of two novellas by Olivia Newport and recommend them to anyone who needs hope, likes women's fiction or loves Christmas stories. I was given a copy by a friend (not the publisher or the author) and all opinions are my own. Christmas in Blue was my favorite tale, too. Christmas stories any time of the year are refreshing to read.